Last Christmas a local village knitted a Christmas tree created from knitted squares and it has been suggested that the people of Northleach could do something similar for this coming Christmas. At the end of the Christmas season it would then be dismantled and stitched into blankets for those in need of Winter warmth. Any shade of green double knitting wool can be used. This includes acrylic mixes. Small squares – cast on 20 stitches. Using garter stitch knit until 3 inches have been worked then cast off. 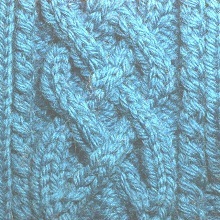 Medium squares – cast on 30 stitches. Using garter stitch knit until 4 inches have been worked then cast off. Large squares – cast on 40 stitches. Using garter stitch knit until 6 inches have been worked then cast off. Not required but if wished work onto the square a small Christmassy motif or the child’s name who knitted the square. For more information please call Bud Dutton on 01451 860341. It is important to stick to the 3, 4 or 6 inch squares so if the numbers of stitches listed above do not suit your knitting tension please vary the number of stitches per square. There will be a collection box available on the ground floor of the Cotswold Hall.